Frequently Asked Questions...When Will My Entry Be Posted?I Have a Question For the CommunityWhere Can I Find the Contest Winners?When Will Contest Winners Be Notified and Receive Payment?Email Address, Password, User Name, & Payment SettingsDidn't Receive Account Confirmation Email?How Do I Sign Up for Newsletters?Not Receiving Emailed Newsletters?Receiving Too Many Emails?Links in Emails Don't Work?Requests for Financial Assistance or Goods/ServicesGuest Articles? or you can click on the Newsletters link at the top of the screen. You will be asked to select which newsletters you wish to receive. 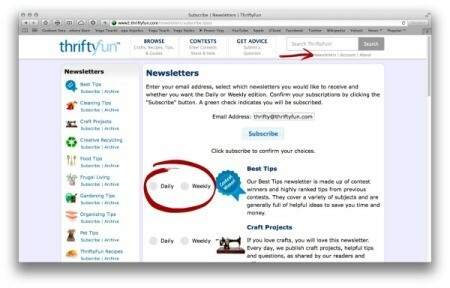 Note that if a newsletter has both daily and weekly options, you should only select one as the weekly newsletter is a digest version with all the content of the daily newsletters. Once you have made your selections and verified your email address at the top of the screen, click the "Subscribe" button. If you are currently subscribed for newsletters and wish to change your subscriptions, you can use this same link to change your selections. You can also unsubscribe entirely by clicking on the "Safe Unsubscribe" link at the bottom of each emailed newsletter. Generated 2019/04/18 10:25:41 in 74 msecs.